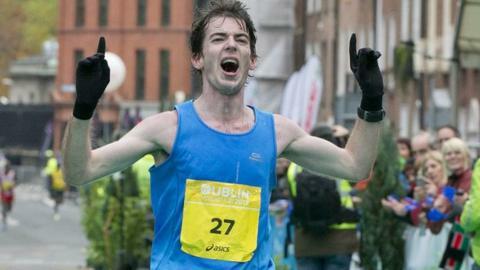 Paul Pollock's decisive fourth-lap break saw him clinch his first Irish Cross Country Championship in Dublin. The Holywood runner finished 34 seconds clear of Portloaise brothers Dan and Michael Mulhare and will now compete at the European Championships in Belgrade. Stephen Scullion from Belfast finished in fourth place. "I am very happy with that win," said Pollock, "I came into the race in great shape and feeling confident that I can compete with the best in Ireland." Pollock said the race went to plan after he had raced away from a field including defending champion Joe Sweeney, who finished fifth at the 2011 European championships. "I sat in for the first three laps. Others where breathing hard and I felt they weren't in great shape," Pollock added. "I decided to kick on and thankfully no-one came with me, so I was delighted." Pollock, who finished as second European - in 21st place overall - in the World Championship marathon in Moscow in August, is determined to do well in Belgrade. "I know I am in great shape going into Serbia. If you sit back at the start going into European cross you aren't going to finish anywhere, so it will be very different from today." Pollock, with Michael and Dan Mulhare, is now an automatic selection for the Europeans, with David McCarthy pre-selected for Team Ireland. Former North Belfast Harrier Scullion, who now competes for Dublin club Clonliffe Harriers, will look to secure one of the two remaining places. Fionnuala Britton was a convincing winner of the women's senior race and she will now aim to make it three senior titles on the trot at European level. Anne Marie McGlynn, who competes for Lifford AC in Donegal, took fourth place behind Sarah McCormack and Sara Louise Treacy. Letterkenny man Ruairi Finnegan was second at the junior men's race behind race favourite Sean Tobin, booking an automatic place on the Irish team in Belgrade.